A spectacle of beauty and fresh color, this bouquet of cymbidium orchids is a picture perfect way to convey your every emotion. 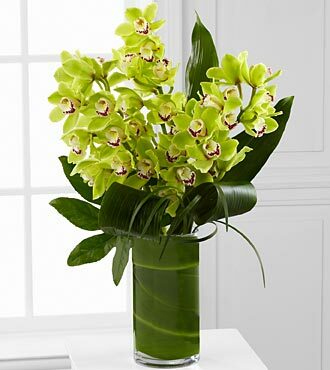 Elegant jade green cymbidium orchids, known for their longevity and stunning sophistication, are arranged amongst a variety of lush tropical greens to create an exceptional flower arrangement. Presented in a superior clear glass cylindrical vase lined with a ti leaf to add that extra special touch of charm, this bouquet will make your recipient's day one they won't soon forget. Includes 3 stems of cymbidium orchids, 4 stems of aspidistra leaves, 1 stem of aralia leaves, 1 ti leaf, lily grass blades and a superior clear glass cylinder vase. Approximately 25"H x 18"W.